Samut Sakhon, 2nd September 2018 – Four people have been arrested along with 130,000 methamphetamine pills and three kilograms of crystal meth or “ice”, worth 15 million baht in total, in Muang Samut Sakhon district. The four suspects, charged with possession of illegal drugs for sales, have been detained at the province’s prison. They are identified as Nopphadol Khamanee, 31, Kathariya Soros, 27, Weerachai Rungrojnetikul, 36, and Thanathepchai Hunlamphoo, 36 years of age. 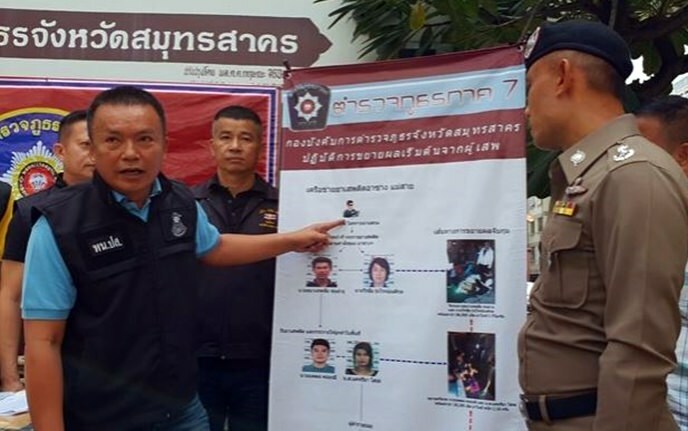 The Provincial Police Region 7 Chief, Pol Maj Gen Suraphong Chaijan, said the suspects, whose arrest stemmed from police’s previous capture of drug addicts, were part of a drug ring led by a major drug dealer in a neighboring country known only as “Xang”. He added that police would continue to look for more accomplices.